Start reading Wild Power on your Kindle in under a minute. Alexandra has a background in education and psychotherapy. 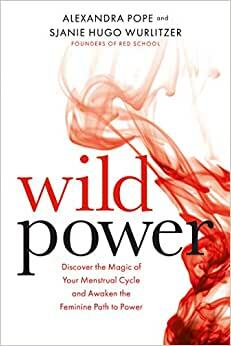 For over thirty years she has been developing this radical new approach to the menstrual cycle and women’s power, and is considered as one of the leading pioneers in the world. Sjanie has a background in hypnotherapy and psychotherapy. She founded The Fertile Body Method–a mind-body approach to fertility issues. Through her successful online program she has trained therapists worldwide to use this approach. Sometimes there's a book that knocks you off your seat and forces you to PAY ATTENTION TO YOUR LIFE in a totally new way. This extraordinary book is one of them. I never hated my period before, I just didn't pay it much attention. But after hearing the authors talk about the "extatic states" they experienced during bleeding and the incredible power that could come from living into one's cycle, I was intrigued. As per their instructions, I've now been tracking my cycle for a while, and it's an understatement to say that it's changed my life. I have much more understanding of myself as a cyclical being, more compassion for my ever-changing abilities/moods/needs and an ability to plan my life around such changes that makes the questions of when to create, when to socialize, and when to cocoon myself a lot more manageable and, dare I say it, magical. This book is up there for me with Brene Brown, Tara Brach and the Big Book of AA in terms of how much of an impact its had on me. Thank Goddess that these women wrote it. 3.0 out of 5 starsOnly 5-10 pages that are actually worth reading. She keeps repeating the same thing over and over in the book, concepts that sound more like stories of other people's experience in her Red school program (that you need to pay for on your own later through her website if you want the REAL information), not necessarily teaching you more than 5-10 pages worth of solid info about how the menstrual cycle has "seasons" that you can follow and if you identify how you feel at the time=identify the "season" youre in=work and function a little better in your daily life ,etc. Overall, its 3 stars because it gave me a few pages worth of info. But aside from that, its repeating the same guideline, stories from others, and her asking tons of questions like "Have you ever felt like.....". Its not that informative. I would buy another book. I LOVE this book - it's making such a difference in the way that I use and save my precious energy and the way that I speak to myself. I have a new kindness and gentleness half the month that is both giving me joy and actually making me more productive because I know better what to expect from my body and can plan with that, instead of just getting overwhelmed and beating myself up about it. Thank you Sjanie and Alexandra for this important work!! 5.0 out of 5 starsEvery woman MUST read!! Alexandra Pope has long been an inspiration in my life and her writing marked a turning point after which it was never the same again. This book is of the powerful and practical variety, one to read and pass on in the hope that over the next few months it'll reach all of your friends and friends of friends and make a change in their lives.